Here’s an example healthcare industry case study that quantifies the value of System Dynamics. I saw the presentation at the 2011 International System Dynamics Conference. The presentation made an impression as it clearly explained the complex medical problem, how System Dynamics was used to create teh solution, and financial benefits. Case study of healthcare innovation: System Dynamics computer model helps Mayo Clinic improve anemia management, substantially reduce treatment cost, and improve quality of life of End Stage Renal Disease (ESRD) patients. Mayo Clinic is a nonprofit medical care provider and research group based in Rochester, Minnesota. In 2012, they treated over one million unique clinic patients. This study is conducted by researchers from Advance Management Group, LLC, Mayo Clinic, and Dana-Farber Cancer Institute. The paper, Individualized Medicine and Biophysical System Dynamics: An Example from Clinical Practice in End Stage Renal Disease, is by Jim Rogers, Edward Gallaher, Craig Hocum, David Dingli, T. Ronald Chrisope, James McCarthy. According to the CDC1, more than 10% (over 20 million) of U.S. adults aged 20 years and older have chronic kidney disease (CKD), also known as chronic renal disease. Most are not aware of their condition. If left untreated, CKD can develop into more severe conditions. Kidney produces Erythropoietin or EPO, a hormone that induces red blood cell production. So without proper kidney function, one of the severe conditions is anemia caused by chronic renal failure. Patients who develop this type of anemia mostly use Erythropoietic Stimulating Agents (ESA) to manage the condition. ESAs were in use since 1988 but the drug remains expensive (U.S. government’s Medicare reimbursements for ESA in 2008 approached two billion dollars). Furthermore, even with 25 years of use and refinement of treatment process, the drug can still cause side effects. Problem for Mayo Clinic: additional staff time and hospital resources are required to treat patients with abnormal Hgb levels. A System Dynamics bio-pharmacokinetic computer model of erythropoiesis was created to determine the cause of oscillation. Researchers discovered that the oscillations are due to time delay of the Erythropoietin Stimulating Agents. The causal loop diagram shows with a normal person, kidney regulates blood oxygen level by increasing Erythropoietin. 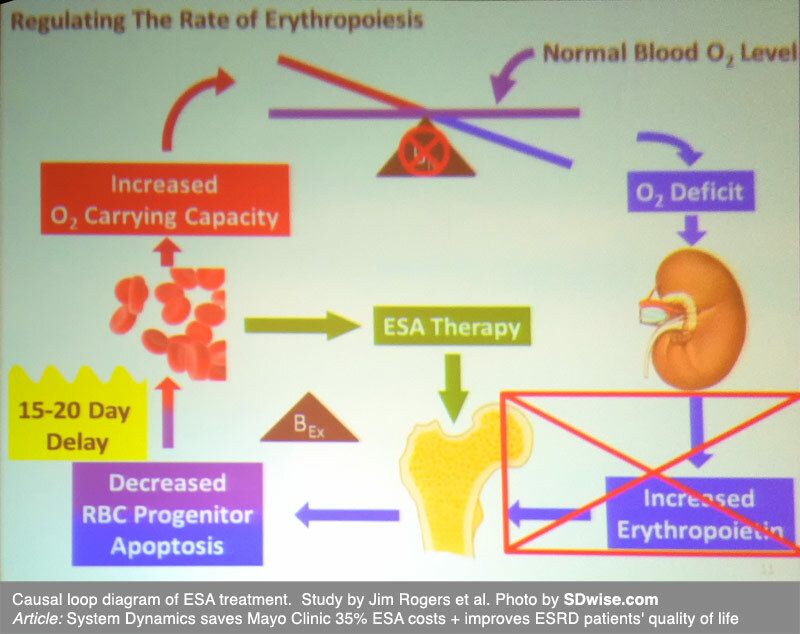 But with ESRD patients, that function is not available (crossed out in the lower corner). The patients require ESA Therapy. The problem is that there’s a 15-20 day delay. At the 2011 presentation, the researchers said a product is under development for the wider medical industry. So, what happened since then? SDwise got in touch with McCarthy, James T., M.D. of Mayo Clinic. He declined to comment at this time for reasons of confidentiality. He wrote that there’s a possibility that he can offer some comments in six to eight months.